Plums can be divided into three types: European (including the Damson), Japanese and indigenous American species. They are related to peaches, and the production practices for these two fruits are very similar. However, there is one major difference between the two. While peaches are self-fruitful, many plums are self-unfruitful. Plums need to be pollinated by another variety of the same type of plum. For example, two varieties of European plums can cross-pollinate, but European plums cannot cross-pollinate with Japanese varieties. Plums should be planted 18 to 22 feet apart. They will grow in a wide variety of soil types, but prefer deep, well-drained soil ranging in texture from a sandy loam to a sandy clay loam. Avoid areas where root-knot nematodes have been a problem. In the fall prior to planting, prepare the area by soil testing and incorporating lime as needed to achieve a soil pH between 6.0 and 6.5. Plant as early as possible in winter. Do not place fertilizer in the planting hole or fertilize immediately after planting. Wait at least six weeks after planting to fertilize. Fertilize newly planted plum trees in early spring before leaves appear. Broadcast one cup of 10-10-10 fertilizer over an area 3 feet in diameter. Apply additional nitrogen in mid-May and mid-July by applying a half-cup of calcium nitrate or ammonium nitrate evenly over an area 2 feet in diameter. March application – Apply 1 cup of 10-10-10 for each year of tree age to a maximum of 12 cups for mature trees. August application – Apply 1 cup of calcium nitrate or ammonium nitrate (equivalent) per tree per year of tree age to a maximum of 6 cups for mature trees. Always broadcast the fertilizer in a circle at least as large as the circle created by the limbs. Be careful not to concentrate the fertilizer near the trunk of the tree. Plums are dormant-pruned slightly differently than peaches. Thinning cuts that favor (i.e., leave) outward-growing branches are necessary to “spread” the plum’s upright tree form so that sunlight can penetrate the inner canopy and enhance fruit spur production. After the first growing season, heading cuts should be avoided. Begin dormant pruning after February 1 to reduce bacterial canker infection. Pest problems are similar to pest problems on peach. Brown rot is the most common disease. Fungicides labeled for brown rot control on peaches can be safely used on plums. Plums can be troubled with a disease known as black knot. This is a warty looking growth on the limbs. Prune off and destroy all affected limbs. Plums are also susceptible to bacterial canker infection, which can be reduced by using selected rootstocks. Insect problems include plum curculio, which causes wormy fruit, and peachtree borer, which attacks the tree at the soil line. Read and follow all label directions when using any pesticide. Many varieties are available. 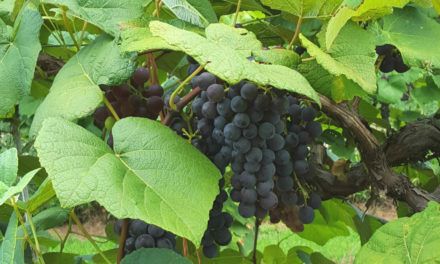 Among the more popular varieties are AU Amber, AU Homeside, AU Producer, AU Roadside, AU Rubrum, Black Ruby, Byron Gold, Crimson, Frontier, Methley, Morris, Ozark Premier, Robusto, Ruby Sweet, Segundo and Wade. Plum varieties are usually budded to peach rootstocks. In the Coastal Plain, use Nemaguard or Guardian rootstocks to resist root-knot nematodes. In the rest of the state, use Lovell, Halford or Guardian rootstocks to reduce bacterial canker infection. As a rule of thumb, plums are not self-fruitful; they need to be pollinated from a different variety that blooms at the same time. However, A.U. Amber and Methley are exceptions to this rule because they are partially self-fruitful. They can be planted as single trees with the understanding that production may be light in some years. 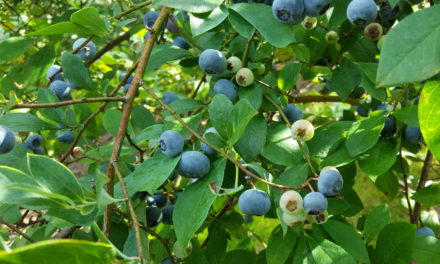 Fruit set of these cultivars will be improved with the addition of other cultivars as pollenizers. Except in years of extremely mild winters, most recommended plum varieties will have sufficient bloom-overlap to ensure cross-pollination. Plums are productive and may yield 2 to 3 bushels per year. As the fruit ripens, it develops a powdery color. You may prefer to pick the Japanese varieties a few days before they are fully ripe and allow them to ripen in a cool room. Plums can be eaten fresh or used in baked goods. They have a relatively long storage life under refrigeration. Plums may be preserved in a number of ways – such as jellies, jams and juices.